Due to the increasing amount of snow and the road conditions, the library will be closing today at 4 pm. Thank you so much! will be held on Wednesday, April 17th at 6 pm at the Library. All are welcome. We encourage you to join the Association. Annual Dues are $10.00/individual and $20.00/family. 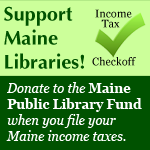 Dues help to buy new books, fund activities, & support library operations. We hope to see you there! For more information, please contact the library!